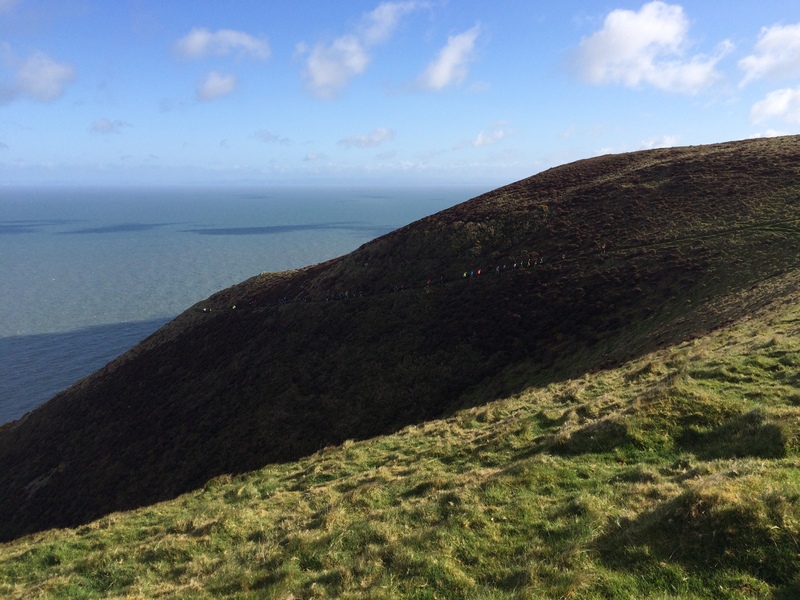 This will probably be my last Endurancelife CTS event… for now. We’re heading back to Australia on Monday 04 May and there just isn’t time to squeeze in CTS Pembrokeshire on the Saturday before departing. The CTS events have been a real eye-opener for me; they’re well organised and well supported, tough courses set in spectacular locations. Sure, the uber-athletes get around the course, fast, but taking time during the “race” to stop and grab a few photos is time well spent, regardless of the effect on the finishing time. There is a part of me which thinks the events in which I have participated have spoiled me, I doubt there are many courses back home to compete with the raw beauty of the CTS courses although the weather at home is probably better! In the three weeks since the CTS Sussex Half Marathon I’d been doing some good training along with my physio regime; I could have done a bit more work, but Easter was spent with Tracy and some her family “up north”. I thought my knee and hamstrings were getting better but they were still a long way from being what I’d call 100% healed. The best way to describe my right knee is “soft”; in the practical sense, it’s strong (enough, fingers crossed) but still feels weak and even when sitting I can feel my knee (I’m aware of it) which is quite an odd sensation? After a slow 21km during the week, there was a slight swelling in the knee so I re-started the regime of cold therapy and anti-inflammatory drugs. It’s been a long while since I’d done a proper intervals session, so when I went out on a blustery day a couple of weeks ago to run 15 x 400m intervals with walk-back, I was expecting a tough session. I felt pretty good and ploughed on through the session and even managed to run home afterwards (downwind, of course). I’m not sure whether it could be attributed to that one interval session, but the next parkrun at Fountains Abbey was over a minute quicker than my previous parkrun at Maidenhead, and 22:29 is my fastest 5km in a long time! Maybe I could have gone even quicker but Fountains Abbey is THE most picturesque course I have run — it’s simply spectacular and a MUST DO if you’re in Yorkshire. We headed out from Maidenhead at about lunch time on Friday and this time stuck to the motorways to make it to Exmoor in pretty good time, about three and a half hours. 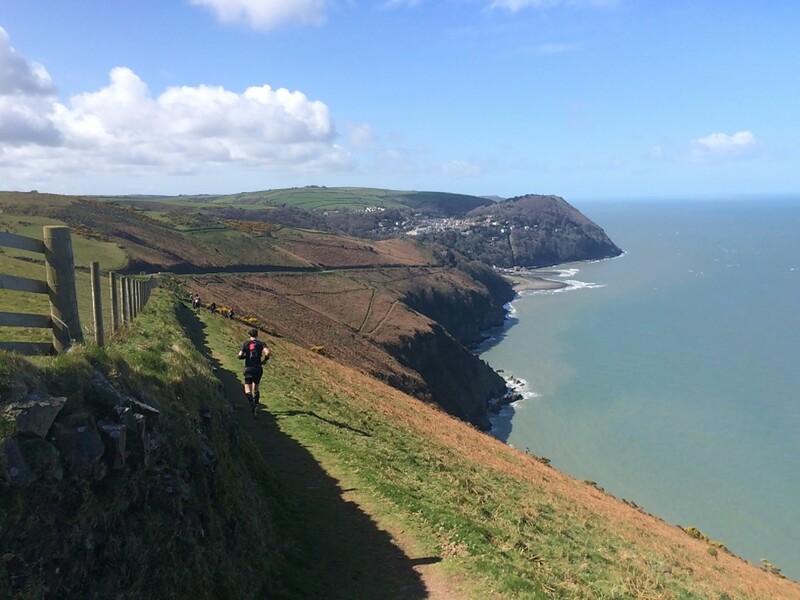 We went first to the Endurancelife start/finish area, and then to Lynton to find our accommodation for the weekend, Ingleside Guest House. 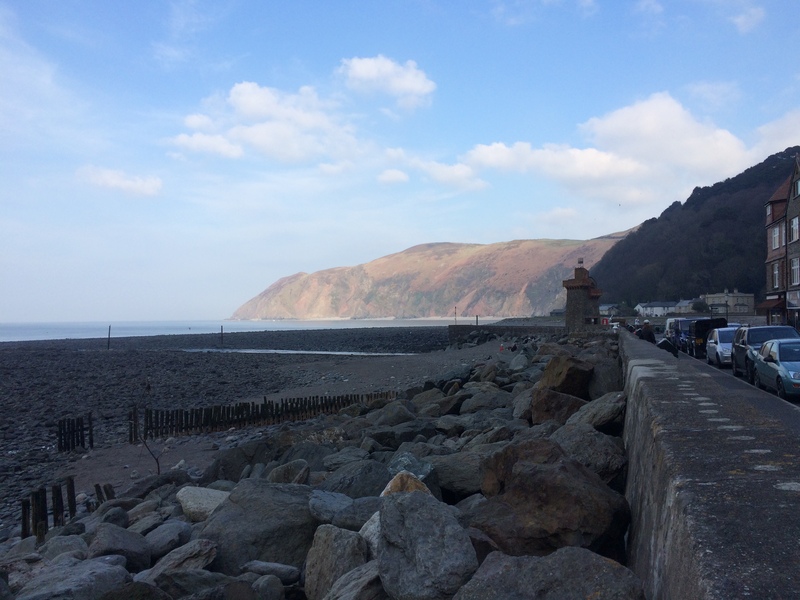 “Jane”, our GPS in the car, sent us on a bit of circle around Lynton and Lynmouth, but we managed to find the place in the end. 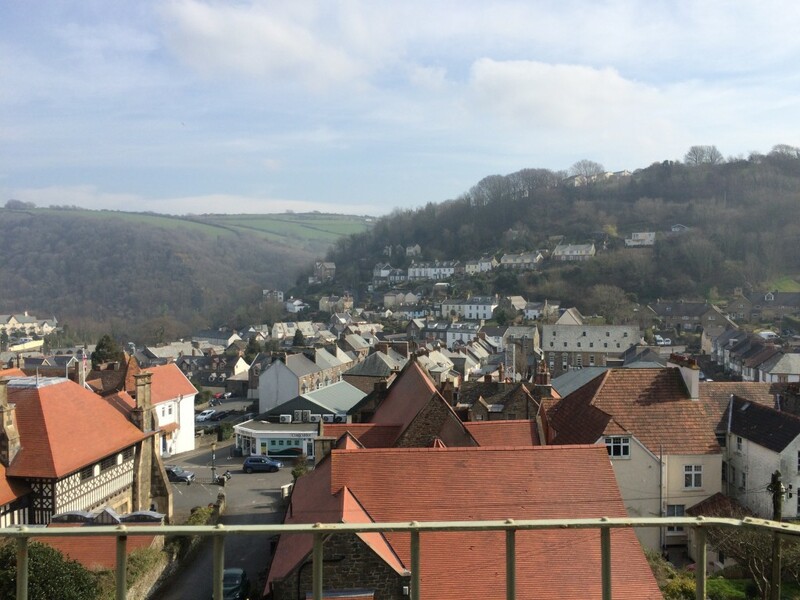 The house was perched on the side of the hill overlooking Lynton, our room was spacious and very comfortable. After a quick rest, we went for a bit of a wander around town to get the lay of the land, very hilly! We saw a few signs for a cliff-top railway and expected some sort of steam-driven engine on tracks taking passengers for a jaunt along the cliff edge to look at the views and scenery; it’s actually a “water-powered” funicular to get passengers from the top of the cliff (Lynton) to the sea-side town at the bottom of the cliff, Lynmouth. We jumped aboard at the top and a few moments later we were on the “beach”, much easier than walking! 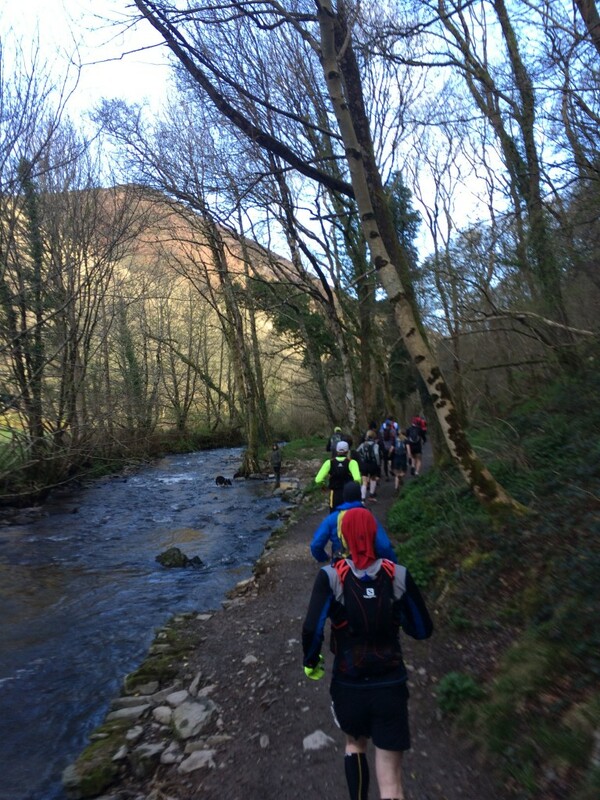 As we were wandering around Lynmouth we found a few Endurancelife CTS chevrons, so followed these to reconnoitre this part of tomorrows course, finding where the track descended from high on another hill to arrive at the river mouth and where the course ascended again afterwards. 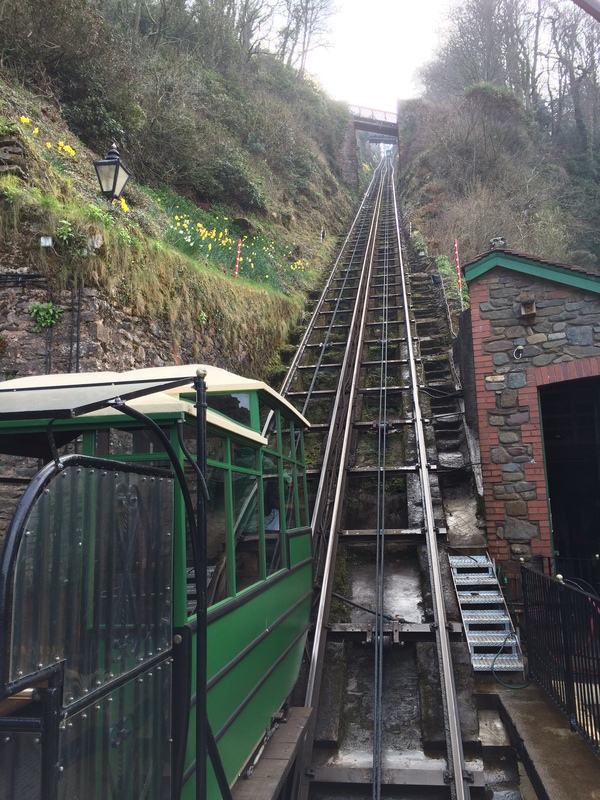 If the terrain is so steep that it requires a funicular to get up and down, you can just imagine the course! We took the railway back to Lynton at the top and then went to find somewhere for dinner. The local pizza and pasta restaurant had mixed reviews, but we thought we’d try it; it was pretty busy and hard to get in anywhere else without reservations. We ate a pretty good pizza, bowl of pasta and salad; the service was good enough and the restaurant was full as we paid and left, we were full too. We retired to Ingleside for an early night. You might remember Craig from previous blog posts? He’s been doing some awesome running lately and in a fit of insanity has stepped up from the marathon distance to compete in the ultra event, 73km with about 3000m of elevation — brutal! Unlike the debacle which was my morning preparation for the previous event, I followed my “normal” routine. We had coffee and a pot of porridge in the room whilst I taped my feet and got dressed. 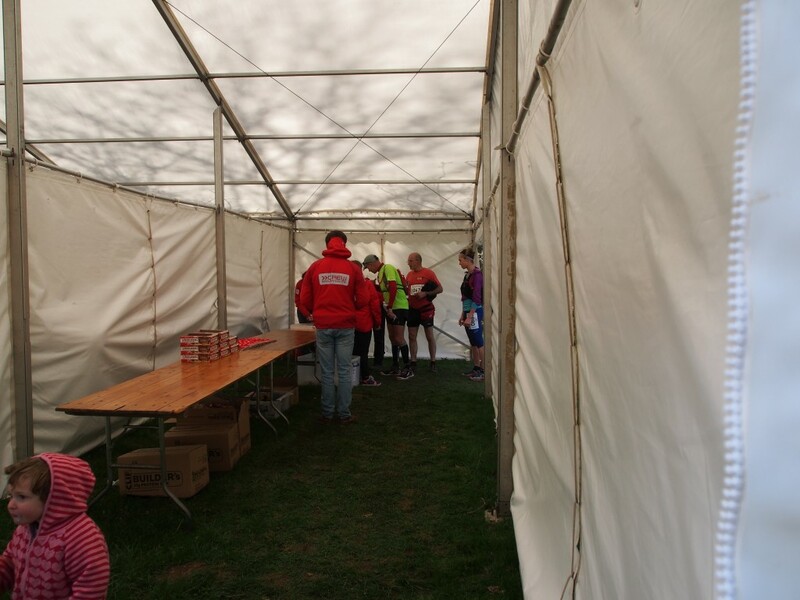 The forecast was for fine and calm conditions, but it had rained overnight and it was still overcast and blustery outside; I decided I’d put on some clothes now and finalise my race-wear at the start line. 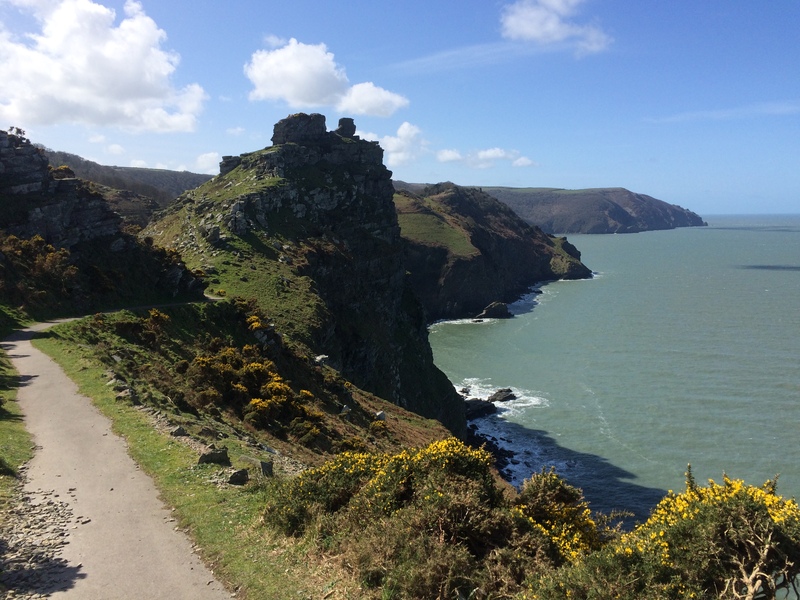 We drove the 20 minutes from Lynton to the start “village” next to Hunters Inn in the Exmoor National Park. The registration process was smooth and quick, proving the queues and delays at Sussex were an aberration. 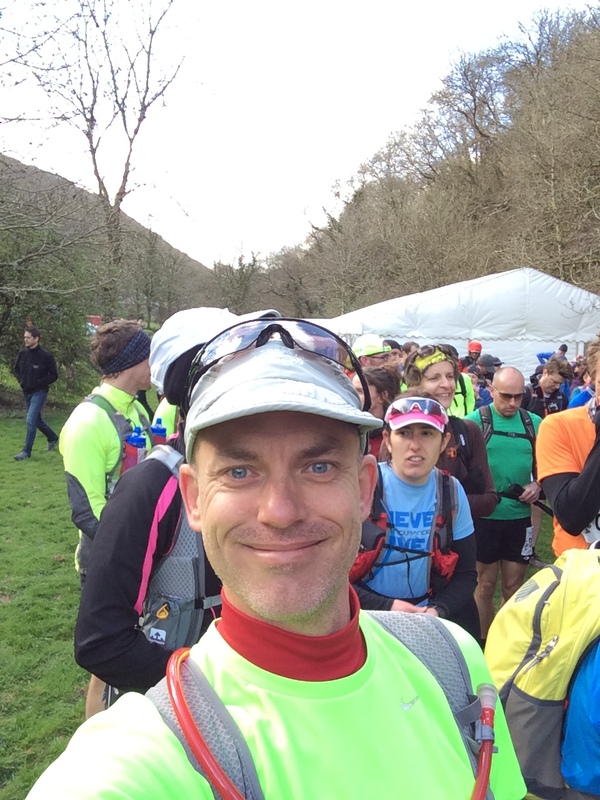 After registering, we went to listen to the ultras safety briefing and managed to spot Craig, he was smiling and looked confident. After the briefing, the ultras were given a few minutes to ditch excess layers of clothing and a final pee before gathering at the start line. There was an extra word of encouragement from the Race Director and a countdown from five before they headed off on their 70+km event, they were more enthusiastic today than at the Sussex start. There was only a very short section of the course where we could see them before they disappeared behind the Inn and started towards the first of many climbs of the day. We were next. Just before our briefing, the sun made its first appearance through the clouds, but it was still cold and the breeze was still quite strong. I finalised my clothing, a long-sleeve shirt with short-sleeve over the top, shorts and cap. They were still forecasting fine and sunny weather although it felt like it was only just above freezing at the start. I giggled to myself when I looked around and realised I wasn’t the runner wearing the most clothing, for once! We crossed the stream using a small bridge and then we encountered the first climb which set the tone for the day. It went up, then up some more, then, around the next bend it went up some more! We were running out of the valley and towards the Bristol Channel, and up. The wind became more apparent as we climbed higher and closed the coast, it was also colder now and the sun was only sometimes popping out from behind the clouds. 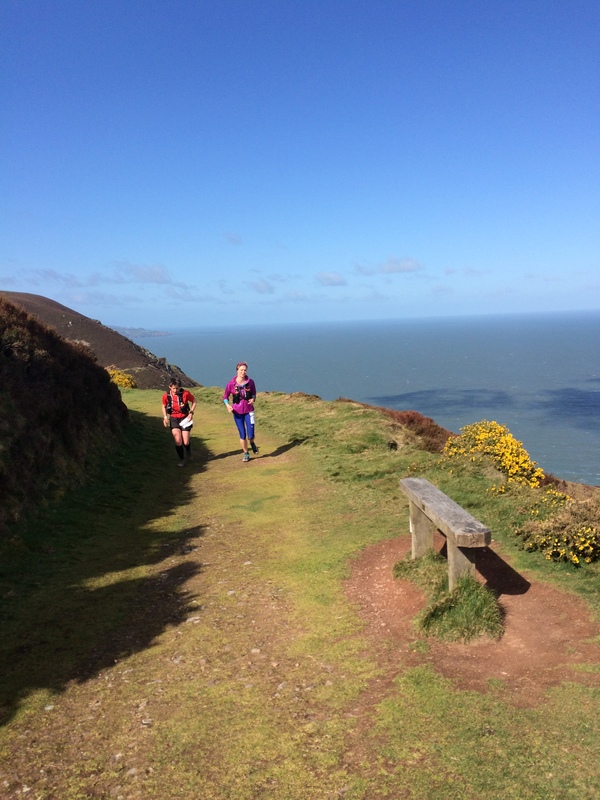 We ran along the cliff edges for a while, being buffeted by an onshore wind; it was sort of nice in a way that we were being blown into the hills unlike at previous events when it seemed the wind was always trying to blow you off the cliff edge. 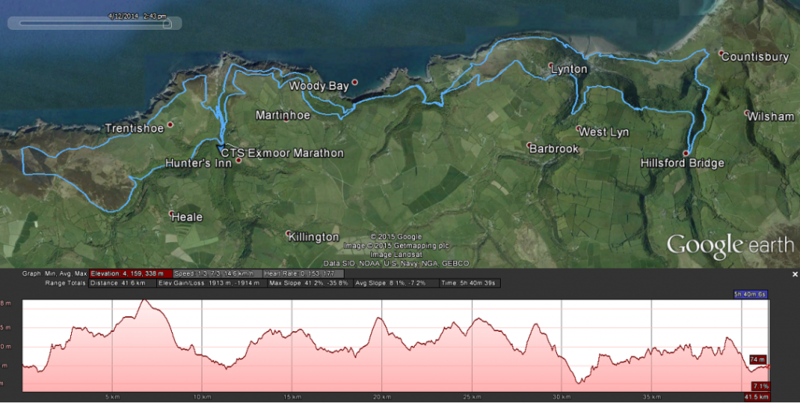 At about 6.5km we turned from the coast and started up a climb at the end of this loop of the “bow-tie”. We had the wind behind us as we ascended which made the climb a bit easier and faster. At the summit was a large cairn consisting of thousands of rocks; if you’ve seen the motivational movie on the internet where the runner starts off on the beach and runs up the hill to drop a stone at the summit — it made me wonder how many people had run up and down this hill, grabbing a rock from the bottom and bringing it to the top. No wonder there are so many good hills runners around here! I looked at my watch and noted the average pace for the first 7km to CP1 was 7:24/km which was 10 seconds per kilometre faster than my 5h30m pace; I consciously backed off a little, or at least I thought I did as we started the descent to the start/finish village to complete the western loop of the bow-tie. By the time I was at back to the start at about 11km, my average pace was now about 6:24/km! I was a long way ahead of schedule, I had to back off more or risk blowing up before the finish; I was still feeling fresh, full of energy, smiling and happy. Tracy was there, so I stole a kiss before heading up behind the Inn to start the eastern loop. We headed out towards the coast for the second time. This time we took a different path from the first loop, but we were still sheltered from the wind whilst in the valley like before. We approached the coast after a bit of a climb but before we were at the edge we turned; the path was a bit further inland on the way out but closer to the coast on the way back. Fortunately, the wind was a bit behind us and the sun made a few short appearances. The runners by now were well and truly spread out. I was running for quite a while with no-one else in sight; it was beautiful. From time-to-time, someone would come passed me or I’d pass someone; an opportunity for a quick chat before finding solitude again. 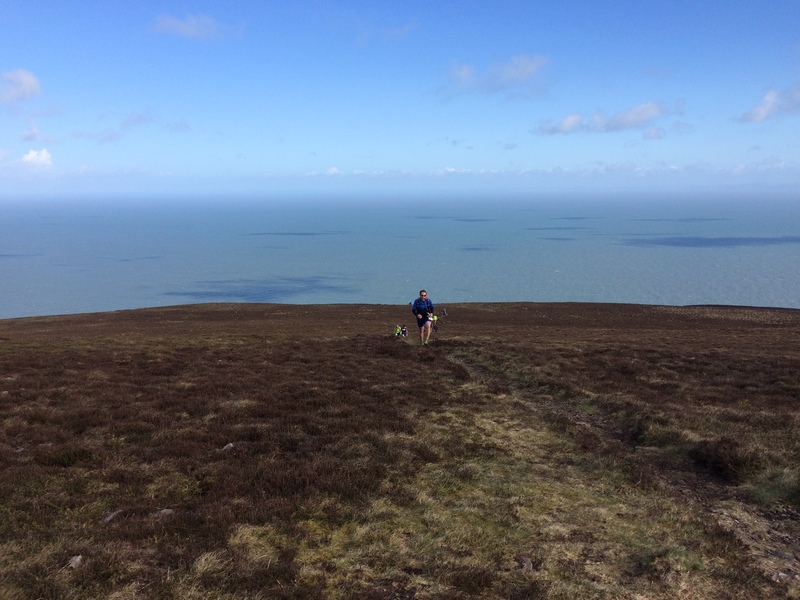 There was a lady who’d overtake me on the downhills but I’d overtake her on the uphills; as there were so many, we saw each other quite a few times! It turned out she was a local dairy farmer and used to milk the cows in the morning then go for a run and then return in time to milk the cows again in the afternoon; no wonder she was so good on the hills. I think I grossed her out at one point when I removed my cap and wrung out the sweat and then replaced it on my head. It may have only been 2 or 3 degrees but I still sweat! I checked into CP2 at 16.5km still showing an average pace of 6:24/km. I thought I had been easing back to prevent fatiguing too early, but I was still moving fast and well ahead of schedule. Tracy was there, so I got another kiss! The course took us through a lot of fields and woods, across rivers, behind Lynton and eventually to CP3. We’d been up and down so many times I was beginning to wonder if we were running on a roller-coaster. Again, for long periods I was completely alone on the course. I started playing mental games to keep myself occupied, like seeing how far ahead I could spot the next course chevron or marker tape. It was hard because I needed some scoring method, so I started trying different ways to award myself points; it kept me busy. 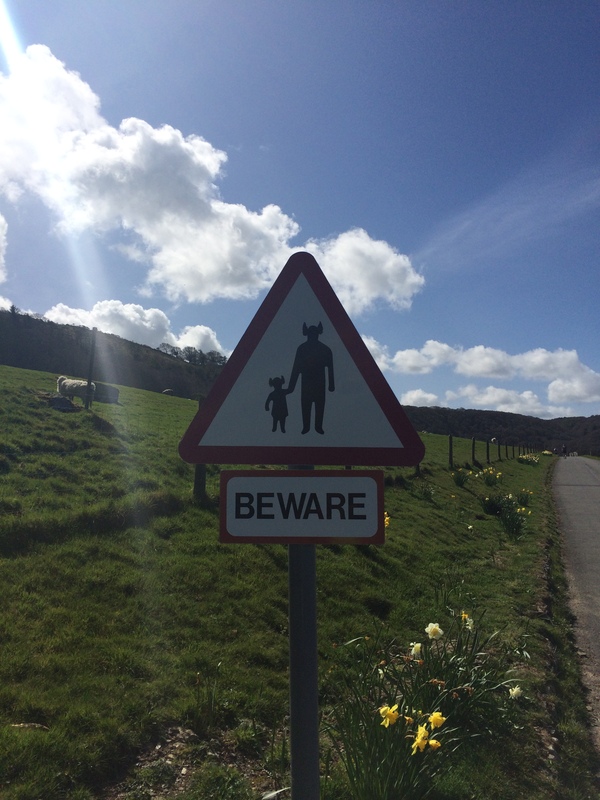 There were also lots of people wandering around in the middle of no-where! The region is very popular with trekkers and walkers, so you’d round a bend and there would be a group of people standing off to the side of the course, clapping and cheering as you ran passed. Eventually, we came flying down a steep descent into a valley, across the bridge over the stream and into the checkpoint. Tracy was there again, so another kiss for me; I was having the BEST time ever! Tracy and I decided that I had to be completely self-sufficient this event as she wasn’t positive she’d be able to make it to the various places on the courses to provide my drinks, so I had to stop for a while at CP3 to top up my hydration pack and Tailwind. I looked at my watch again and nearly fell over — I was pacing for a 4h50m finish! I knew this was too fast. I started to get annoyed with myself. I knew I had to slow down but I wasn’t slowing down. I might have been feeling really good now, but at this pace, I knew it couldn’t last. I reminded myself to have more regular looks at my watch, I mean why not? I was wearing it, why not look at it from time to time, right? After CP3, we headed north towards the coast again, following the river for a while. There were a lot more people in this area, families enjoying the wooded paths and picnics in the clearings etc. I could see other runners from time to time, but I could hear claps and cheers from the spectators more than I could see the competitors. The flat run along the valley floor had to come to an end, for us to climb up to the top of the hill at the eastern end of the course, and to uncover from the shelter of the valley woods to find the wind again. We crossed the road at Countisbury, to rejoin the coastal path and start heading back towards the finish, via Lynmouth. 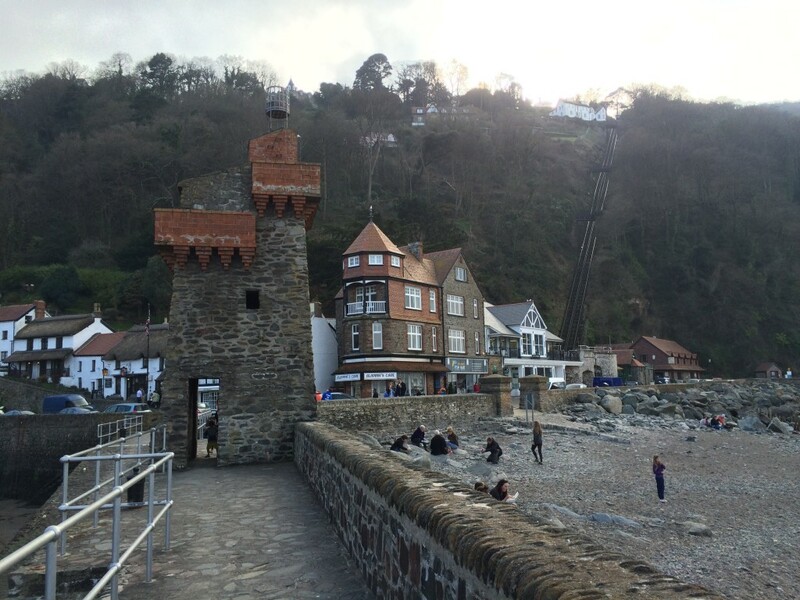 The climb off the “beach” at Lynmouth was brutal; they built a funicular here for a reason! The climb wasn’t that long, but it was steep and like had become the norm for this course, one hill just headed into another climb, then another, and another. As we headed further along the coast, the undulations were actually taking us higher and higher above sea-level. The wind blew in your face but at least the sun was more prevalent now. I think I had finally settled into the right amount of effort and was starting to feel happy again. 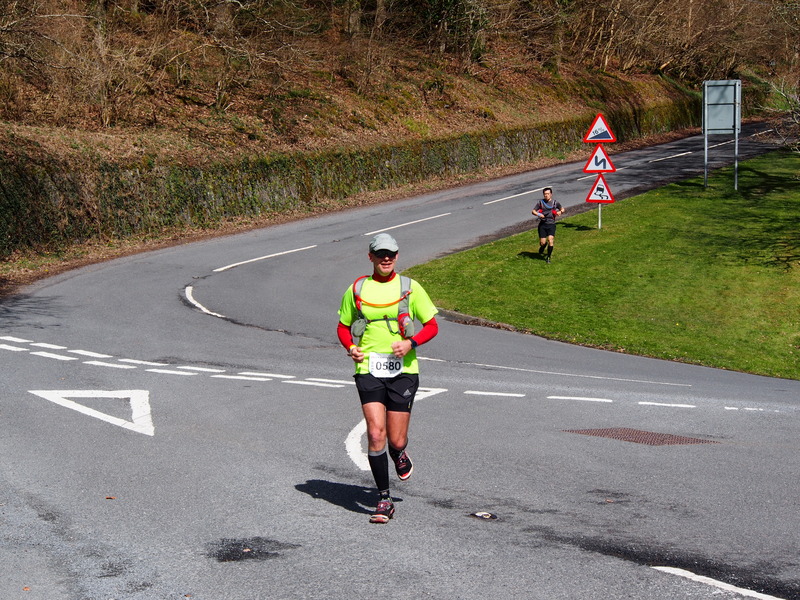 At the briefing, we were warned that because our course didn’t necessarily follow the roads that any road signs weren’t good indications for us; I wished I had remembered that as I went passed a sign which showed 3 miles to Hunters Inn (the finish). I said to myself I had 5km to run or about 30 minutes, I was starting to feel little twinges of cramp but knew I could easily do this final section, cramp or not. After what felt like about 30 minutes I was starting to get worried that I might have taken a wrong turn somewhere as the only runners in front of me were ultras and the only runners I had recently passed were ultras, and I hadn’t seen the “one mile to go” sign. Eventually, another marathon runner came into view ahead of me. I asked her if she was positive we were on the right track; she said she thought were ok so I went passed. Finally, the path rounded a bend and turned away from the coast. I could see the next hill on the other side of the valley, and the ultra runners going up for the second time of the three times they’d ascend it. A little while later there it was, the “one mile to go” sign. I was really happy to see it as I was now starting to cramp just a little more. 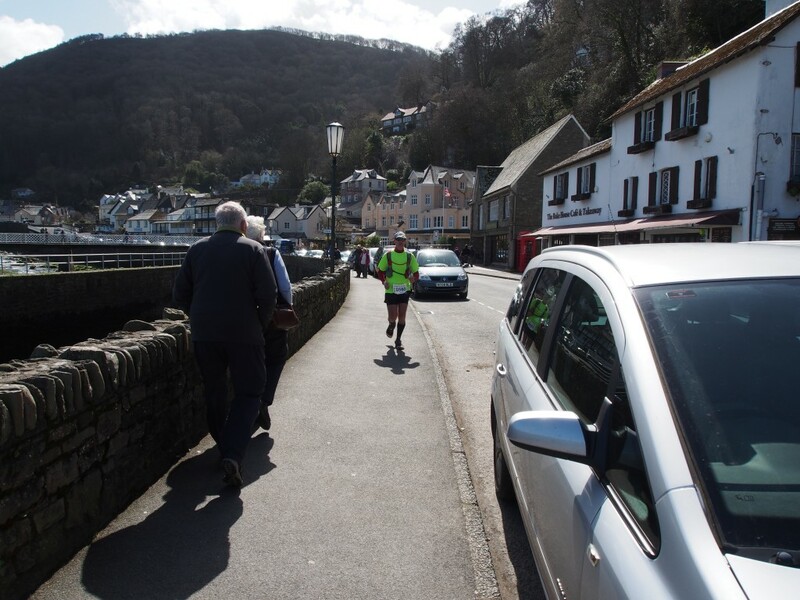 As we got closer to the finish, I felt really, really good… that was briefly squashed when I saw a sign pointing the ultras to turn right and cross the bridge to continue their journey. 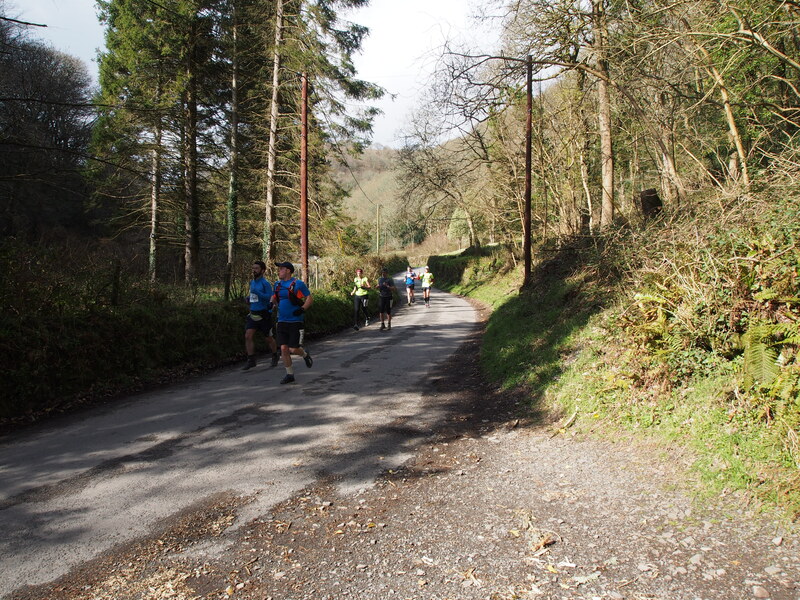 If they kept going straight ahead, in 200m they’d have a chair and food and everything they’d want, they were so close to the finish area they’d be able to hear the beers being poured at the Inn but they had to turn here and go back up that hill again. 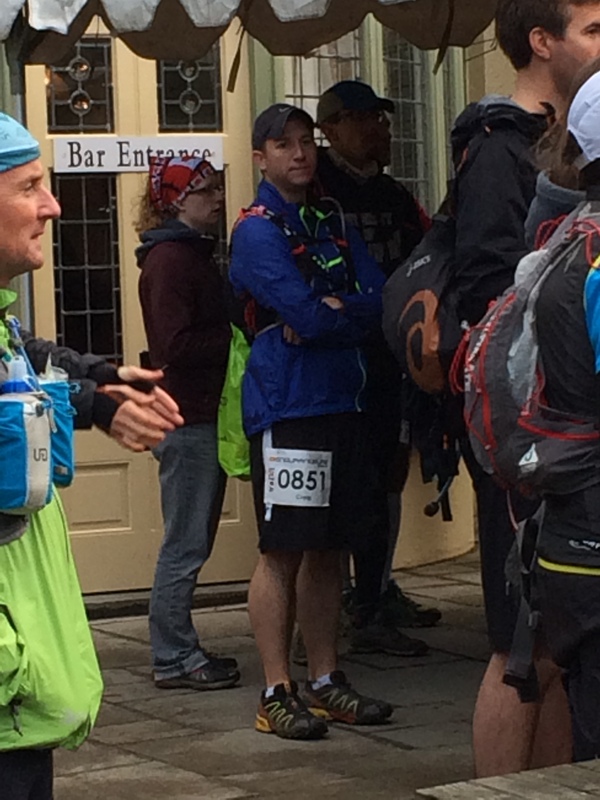 I wondered how Craig was going and how the rest of the field was faring. I’d had just about enough for the day and couldn’t imagine having to run another 30km today. I crossed the line and stopped my watch. I was in disbelief. 5h12m! No f*kin way! I was so far ahead of schedule and was still feeling, for the most part, pretty good. I was happy to finally see Tracy with my jacket; I was so far ahead of time that she’d only just arrived at the finish and didn’t actually see me cross the line. I was cold but not frozen, my knees were great, my hamstrings had minor twinges of cramp but were still intact. To say I was happy with my own performance today was an understatement. 73km in 9h30m. Uninjured. Awesome! It’s Monday now, and despite a little leg soreness, I’m highly mobile and pretty much ready to go again! I’m still buzzing over my time.